dirt don't hurt: Who doesn’t love a walk down the high fructose memory lane? Who doesn’t love a walk down the high fructose memory lane? I’m not really sure how it happened, but I’ve recently realized that every major holiday can be characterized by the candy it involves. Every holiday has it’s candy, and every candy has it’s holiday. And it is as sure as the calendar pages keep turning and the “seasonal” aisle in the grocery store is stocked, dentists everywhere drive nice cars. I call it the “Bermuda Triangle” of sugar, that span of months between Halloween and Easter. I constantly find my kids with that crazed, sugared-up look in their eyes, because it seems that for months on end we are showered with little packs of chocolate and candy canes and candy hearts with ridiculous sayings on them I can’t even understand and the fifty pound chocolate bunny that someone really thinks we need. It’s all just a little too much, and, I must say, a little too delicious. I am, without a doubt, a big fan of the sugar confection. Always have been, always will be. I think it all started way back when on our family weekend jaunts to the cottage on the lake. It just so happened that the bait shop also doubled as a convenience store and had a gloriously long counter filled with a vast array of candies that ended with one of those old fashioned toys where the little penguins climbed up the stairs and then slid all the way back down the chute. So vivid are my memories of being just barely as tall as the counter and filling my tiny paper sack with candy of all sorts, like I was right out of the Willie Wonka movie, except that I was in rural Ohio, wearing cut-offs and flip-flops and was holding a dozen night crawlers in the other hand. But the candy we had back then isn’t anything like the candy we have now. And forgive me for the nostalgia, but I miss the candy of my childhood. I won’t say that the candy now doesn’t taste as good, because really it does. If not better. I just really long for some of the delights that aren’t so available these days. 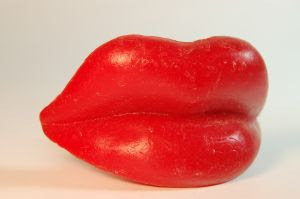 Like the wax lips, which, to this day, I’m not sure were even candy. You couldn’t eat them, you just held them in your mouth and danced around with drool coming out the sides. Eventually, we all chewed them up and remolded them into pretend retainers. Disgusting, but oh so much fun. And speaking of wax, what about the teeny tiny wax soda bottles? The ones that contained exactly .25 teaspoons of a mysterious sweet liquid that didn’t really taste all that great? But boy, was is a thrill to bite the top off of that bottle and throw back its contents, all 2 drops of it. It must have been very popular for a while to make candy that appeared as other items. I know I was very fond of the lipstick which wasn’t lipstick at all, nor did it act like it. That never stopped me from pretending to put it on my lips, leaving a chalky smear from my nose to my chin. We had candy cigarettes that were actually called “cigarettes” and Big League Chew that we all knew wasn’t really tobacco, but we played along anyway by stuffing it into our cheeks. It must have been a real sight to see—a little girl with a Dorothy Hamill haircut and buck teeth, a candy cigarette hanging out of her chalky white mouth and a handful of wax bottles and night crawlers. Somehow, my parents let me do it. They probably saw that same sugared-up look in my eye as I see in my own kids from October through April. And as much as I know it’s not really good for children to eat candy, I can’t deny them the wondrous grandeur that is high fructose corn syrup. Why should I stop them? I have tasted the sweetness, I have enjoyed it, and I have survived. I’ve got the Bazooka comics to prove it. Got any good candy memories of your own? Please share! Oh Karrie! I, too, loved the candy cigarettes, little soda bottles and buble gum with the tiny comics inside!! And how about the "dot" candies on long pieces of paper?? Long skinny strings of red licorice, marshmallow cones, charm pops and the best....candy necklaces that we wore around our sweaty necks and then ATE the pieces! !